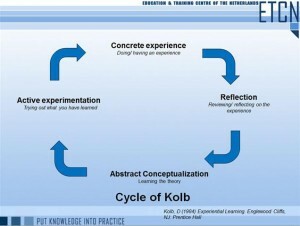 ETCN has accepted the learning cycle of Kolb as the leading model behind it programs. It is the basic didactical model for the classroom variant of the NIMA programs and it will be the core model for the E-learning variant. Mainly the ETCN e-learning programs will start with the conceptualization. With other words, the module planners with the theory will be the starting point of the educational activities. The module planner guides the candidate through the theory and is supported by additional content. Each module ends with one or more practical assignments. These assignments should be sent to the coach for feedback. The writing of the assignment is the “experiment phase”. While writing the assignment and doing research for the assignment, the student has a concrete “experience”. Before sending in the assignment to the coach, the student reflects on the paper. He or she describes the difficulties and challenges while writing the assignment. This “self-reflection” is always related to the competences that are connected to that module. The coach receives the assignment and provides, within several working days, feedback to the candidate. Based on the feedback the candidate can make improvements to the assignment and continue with the next module. All assignments together form the main body of the practical exam. As a result the candidate from lecture one focuses both on preparation for the exam as well as on practical implementation in his or her own working practice.